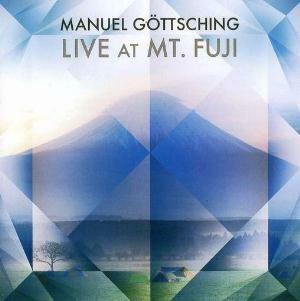 First solo live release by Manuel Göttsching, "Live at Mt. Fuji" features two tracks from the first 70's ASHRA albums, two tracks from his 2000's recent albums and a new composition of 15 minutes. "Sunrain" (from ASHRA's "New Age of Earth") is a bit deceiving. This interpretation sounds more cold and plastic, as if it was played in MIDI, whereas the original studio track possessed its own warm and human feel. The sonorities are not very adapted to the soothing ambiance of this classic electronic tune. Furthermore, this extended version is a bit too long. The slow "Saint & Sinner" (from Göttsching's "Concert for Murnau") is a curious choice for this live album. The languorous ambiance is however reinforced by Manuel's pretty cool guitar play. "Trunky Groove" is a new piece composed for this concert. This previously unreleased track features more modern percussions and some nice sound effects. An enjoyable ambient tune, that sometimes reminds early THE ORB. "Die Mulde/Zerfluss" (from Göttsching's "Die Mulde") is a little more interesting this its studio version. First, it has fortunately been shortened to 20 minutes. Second, there are more variations than on the original, although the 90's cheesy sound effects remain. The rendition of "Shuttlecock" (from ASHRA's "Blackouts") is average as the electronic sequence is too present and thus tends to become slightly repetitive near the end. As a live release from Manuel Göttsching, it is surprising not to hear any extract from his groundbreaking albums "Inventions for Electric Guitar" or "E2-E4". The chosen sonorities are sometimes cheap, which is a bit curious for such an electronic pionieer artist. To sum up, "Live at Mt. Fuji" is half ambient, half Göttsching-esque, not bad, but not great either.